I hate to brag, but I am the proud owner of a new 5.5 quart Martha Stewart Dutch oven. It’s a solid piece of cast iron, a sturdy new kitchen toy, versatile and just plain beautiful. Quite frankly, I’ve been pining for a Dutch oven for months, so much so that my desire for one would creep up on me as I looked through cookbooks and magazines. Recipes that called for using the pot gravitated towards me, almost taunting me because I didn’t have one. Granted, I realize there are instances where another hefty pot could be substituted, but it got to the point where I just had to have a Dutch oven, once and for all. Macy’s was having an awesome “one day sale” around the Easter holiday, and as soon as I could get to a computer, I checked the status of the Martha Stewart inventory. Her products are reliable and affordable, and if I found a Dutch oven with those characteristics that was on sale I’d pretty much take it as a sign that it was meant to be. The selection was pretty extensive with various sized of enameled cast iron pots, and a few colors to choose from. The sunny, happy mustard pot caught my eye, and I quickly added it to my online shopping cart. As if I needed any more assurance that this Dutch oven and I were made for each other, regular shipping at Macy’s.com had it in my possession in three days, way sooner than expected. The hardest part about the entire process was finding the perfect recipe to christen my new toy. After perusing the many recipes I once had to pass on due to a lack of the feature tool, I decided on a delicious Bolognese to accompany homemade pasta. The end result had many levels of flavor without being too complicated. As soon as I smelled the aroma of the onions, carrots, garlic and celery as they cooked down, I knew I had chosen the right recipe to begin my Dutch oven love affair. Instead of pancetta, I added bacon, which really stood out but was not too overbearing. 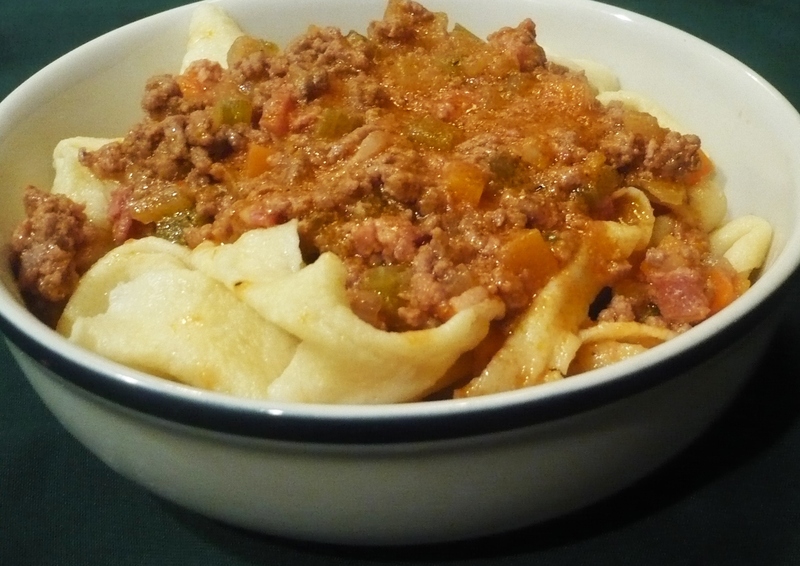 The wine, tomato paste and milk elevate the Bolognese to another level of flavor, and allowing the three to simmer into the meat for about an hour gives the liquids the opportunity to develop, combined, their own unique taste. Cooking with the Dutch oven was as fun as I thought it would be, and it really retained heat while the ingredients didn’t stick to the bottom or sides at all. This certainly would not have been the case with the other hefty, stock pots I own. 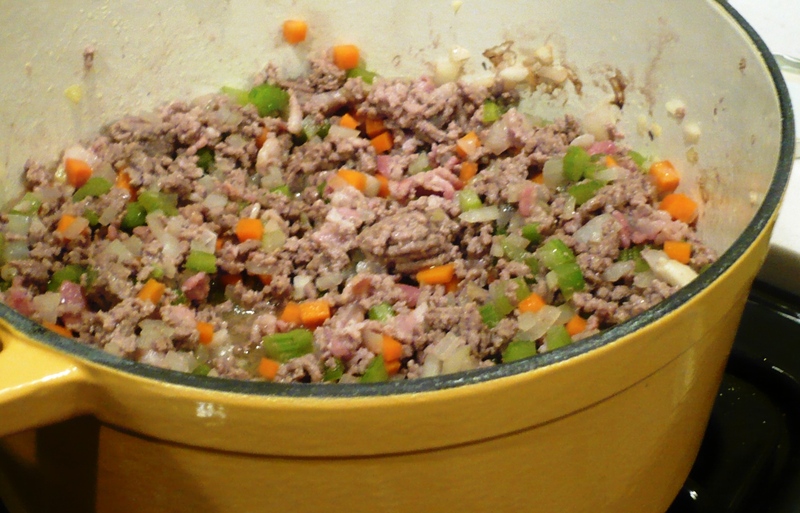 Clean up was just as easy, as the remnants from the Bolognese just wiped easily off the inside surface of the Dutch oven. The Bolognese was delicious, and though I definitely would like to make it again in the future, I can’t make any promises it will happen soon. I have many, many recipes I once passed on that I can now make with my beautiful, perfect, new Dutch oven. Jealous! So Jealous! I need one too…want the red. I have even dreampt about it! 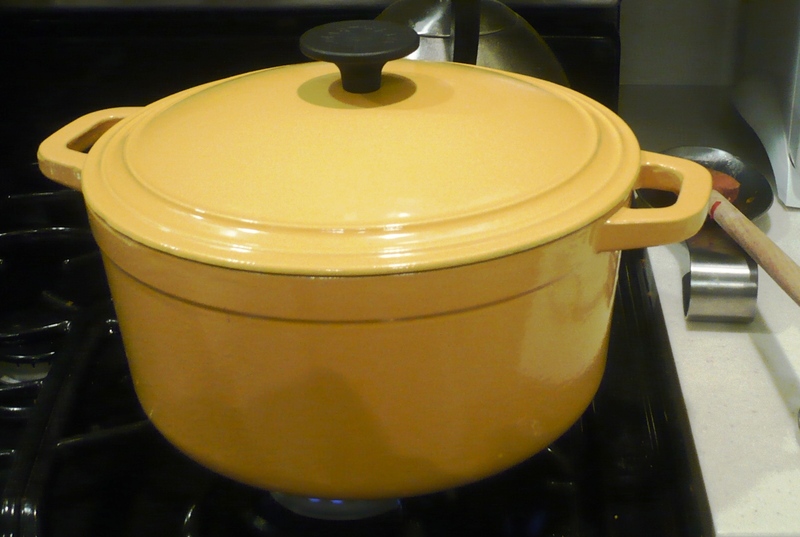 Been 6 long months but promise myself as soon as soup season begins…I too, will be the proud owner of my Martha Stewart Dutch Oven.